It's officially Autumn and boy is my skin feeling it. My little dry patches are even harder to get rid of and I'm just looking pretty dull in general. With this in mind, I took the drug store to find a face cream. I eventually picked out Nivea's Daily Essentials Rich Moisturising Day Cream for dry and sensitive skin, at under £3 I thought "why not?" The first thing I noticed is that the cream is VERY thick - a little really does go a long way. I saw the difference in my skin immediately which was impressive, no more dry patches and I instantly looked "dewyer". 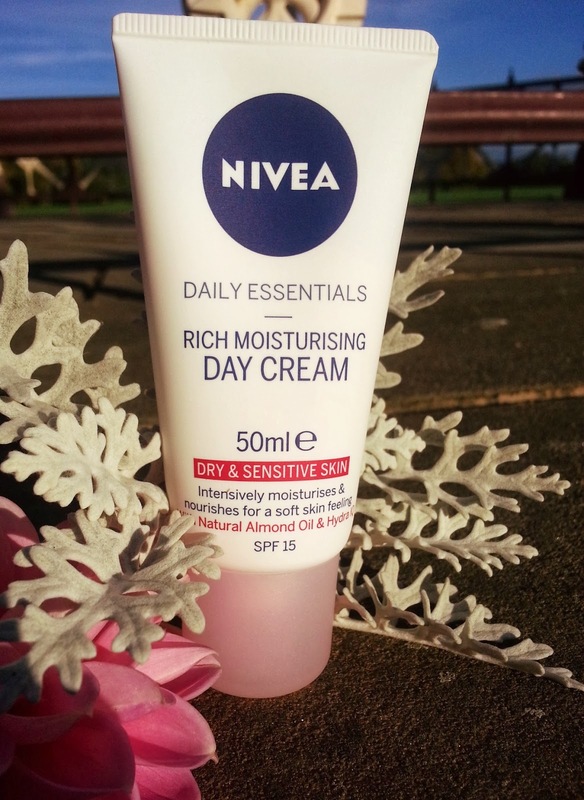 This being said, because the cream is so intensive my face had that horrible greasy, wet feeling you get after applying moisturiser, for absolutely ages. I was worried that I'd break out and my skin didn't feel comfortable at all. I then tried applying my normal make up over the top of it. It was easier to apply and glided on much smoother than usual. My skin also felt more hydrated, however I couldn't see much difference to my skin after putting make up on - it just looked the same as it always does. I also found that my make up was transferring onto my clothes more, as a result of using the Nivea Day Cream underneath (even when I used a primer). I think this cream will have great long term effects and make my skin softer over time. I can already see that this is happening but I'm probably going to have to find a different cream to apply underneath make up, something that won't undo the effect of a primer. If anyone has any recommendations that'd be great!